TRUE PROFESSIONALS SERVING LAKE WORTH AND BEYOND! Are You Having Issues With Your Drains or Sewer Systems? Watch The Short Video Below To See How Hydro Jetting Works! Is Hyrdo Jetting Right For You? If you are facing issues with clogged pipes, reduced pressure, slow draining, build up in drains or any other issues with clogs, drains or sewers than Hydro Jetting may be a service that can help clear out these issues in an effective and efficient manner. This process is fairly simple, but does require proper equipment and a licensed professional in order to properly clear the drain and ensuring that build up will not persist. Hydro Jetting is a safe way to create “like-new” plumbing systems by forcing high pressure water flow throughout the piping. This technique has proven to be one of the most cost effective and results proven tactic used by plumbers in order to assist with clogs and blockage that can not be handled by homeowners because of the severity of the blockage. Have you been dealing with an issue that we can take care of with Hydro Jetting? Let The True-Pros take care of it with our proven techniques! Can Hydro Jetting Damage Pipes? To answer directly, no! Although to be safest when performing these services the proper equipment must be used and a licensed plumber should perform these services to reduce the rick of any issues when forcing pressure of any sort into the plumbing of your home or office. The professional equipment used during this process allows for the pressurized pipe to be placed in hard to reach spots and can maximize the effectiveness when pushing the water through the plumbing. Lastly, using a professional plumber is best when performing Hydro Jetting on older plumbing to ensure that larger issue are not the cause of blockage or pressure issues. Hydro-Jet cleaning is ideal for a variety of areas within the plumbing system including kitchen drain blockage, sewer lines, shower drain blockage, laundry rooms, sink blockages, floor drains, tubs and any other draining systems within house hold or office spaces. What is The Difference between “Snaking a Drain” and Hydro-Jet Cleaning? There are multiple differences between these two strategies to cleaning a drain. First, when snaking a drain this typically only works with mild to medium clogs in order to free the plumbing for short term purposes, leaving behind possible build up and mineral building on side walls. The improper use of snaking can also cause further issues and damage the plumbing system which can lead to more costly repairs. Lastly, the use of Hydro-Jet cleaning ensures that build up and clogging is freed through out the entire plumbing system. This is a complete solution to the problem and has proven to assist with issues in the most effective way while reducing risks. Complete Plumbing systems with no money down! Call us today for our simple financing application process. 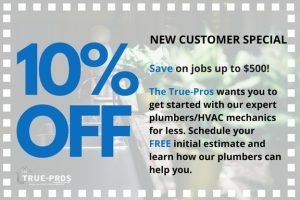 Thank You For Choosing The True Pros For Your Plumbing Needs! Request an Estimate Online and We'll Get Right Back to You! The True-Pro team will always provide you with the complete home solutions that you need for every service! Our Master technicians offer honest diagnoses, never upsell, and will work with you to decide what works best for you. We are always available when you need us, providing great, quality service. Contact us today to ensure your home systems are always working perfectly. We offer a 100% satisfaction guarantee on all workmanship for your repair. Are you a new customer? * Are you a New Customer? Yes, I am a New Customer. No, I am a Current Customer.